Longtime readers of The Hartfordite are familiar with our struggles with the family Christmas card over the years. Blurry pictures, cranky children, an uncooperative cat, weather, getting called in for breaking news and other obstacles often have Kara and me scrambling to get a card out by December 25th. I can report this year was easy breezy. We decided to take a family picture over the summer and had the card printed and ready to go by December 1st! Yes, the Houses were “those” early people this year. As I heard my friends complain of their cards still being processed at photo sites on December 20th and some of their cards arriving on New Year’s Eve, I think we made the right decision. 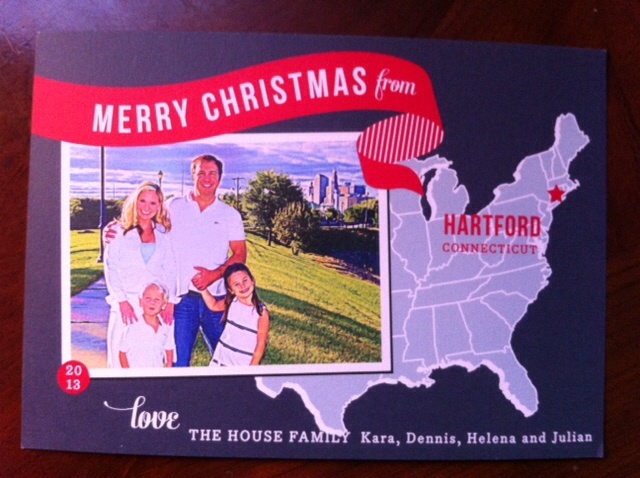 I really thought our holiday message rocked, until we heard about the Holderness family of Raleigh, North Carolina. Dad Penn and Mom Kim are like Kara and me, all television news anchors (Kim and Penn now run a video business,) and we both have cute older rainbow loom junkie daughters and sons who are perpetually canoodled by their infatuated teachers. Obviously the Holderness family has raised the bar for future Christmas greetings. To all of you Happy New Year and best wishes for a great 2014! By the way, this year’s photo was snapped at Charter Oak Landing. JAMMIES for the House family next year?????!!!! !